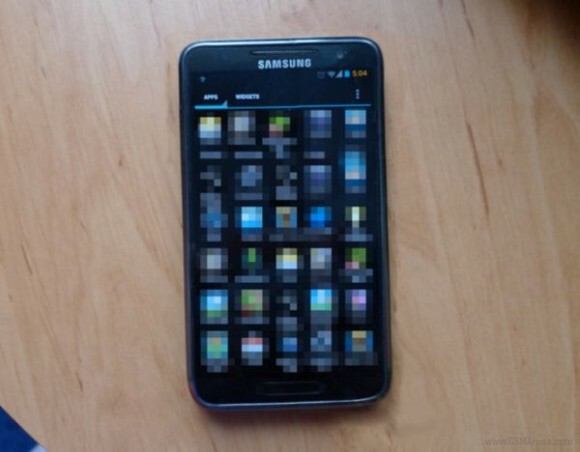 As the rumours for the upcoming Samsung Galaxy S III keep flowing in, we have another one for you. Submitted by a device tester, the image below is said to be of the device in person. This live image does match the rumours that have been going around, like the screen seems big enough to fit the 4.6-4.8 inch display rumours. The platform is of course Android 4.0 but somehow it seems to look like stock Ice Cream Sandwich without the hateful TouchWiz UI. So this could be a test dummy after all, or maybe Samsung wants to pour in some stock features for a change (we really hope so). Also this device has a 5 column app menu, but it has been pixelated by the submitter, probably for privacy issues. There’s a tradition single home button in between, and it looks more of a rectangle than the usual square one on Samsung smartphones. So this does seem a pretty decent looking handset, and if this does turn out to be the S III, then we sure hope it is loaded with some high rated specs and features.